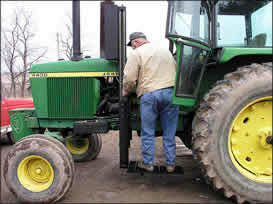 Many agricultural producers who are affected by spinal cord injuries, neuromuscular impairments, or leg amputations use a lift to gain access to their tractor, combine, or other agricultural equipment. Although some producers have purchased commercially manufactured lifts, many others have built their own or enlisted a local fabricator to design and build one for them. The information presented in this brief is intended to highlight facts and ideas that those who choose to fabricate a lift should consider before beginning the risk. Producers generally use one of the four most-common types of lifts. A platform lift for individuals who can stand but not climb, such as the Lectra lift. A chair lift for individuals who can transfer from a wheelchair to a chair lift, such as the Pilot Lift from Life Essentials. 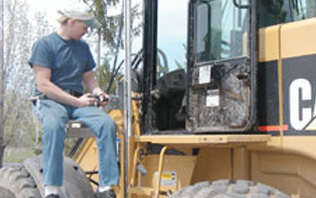 A portable or independent multipurpose lift that can be used for more than one piece of equipment, such as the Freedom Lift from Freedom Technologies. A homemade sling lift for individuals with severe injuries for whom transferring to a chair lift might be too difficult or whose tractor has an entryway to the operator station that is too narrow to access in any other way. While three companies manufacture tractor lifts, the majority of tractor lifts currently being used are still fabricated by the user or someone he or she hires to do the job. These non-commercial lifts are not without risk of causing secondary injuries. In fact, in a study of 21 homemade lifts, 38% of the operators reported having fallen from their lifts (Willkomm, 1997). The cost of secondary injuries that result from falls can be significant. In an article about secondary injuries and spinal cord injuries, Michael Bonninger, M.D., reported that surgery and rehabilitation costs associated with a shoulder injury due to a fall can be as much as $100,000.00 (Seeman, 2000). Cuts, bruises, and scrapes can also occur during transfers leading to potential skin ulcers or infections requiring thousand of dollars in treatment. Commercially available lifts with warranties, liability coverage and a proven track record should always be the first choice when selecting a tractor lift. However, unlike automobiles, there are no standards with which a farmer must comply in selecting or constructing a lift for his or her tractor. In addition, due to limited resources, many farmers feel forced to choose less-safe locally fabricated lifts over the more costly commercially manufactured varieties. Until lift standards are mandated for farm equipment, locally constructed/homemade lifts will continue to be used. (480) 456-5438 or toll free at (888) 224-1425. Disclaimer: The vendors listed do not represent an endorsement by AgrAbility in Georgia and is provided only as an introduction to the many vendors that produce adapted products.